Typically, methanol is used for hydrate control during startup. During startup of the production wells, methanol was bullheaded into the wellbore until pressure equalized across the SCSSV (Surface Controlled Subsurface Safety Valve). 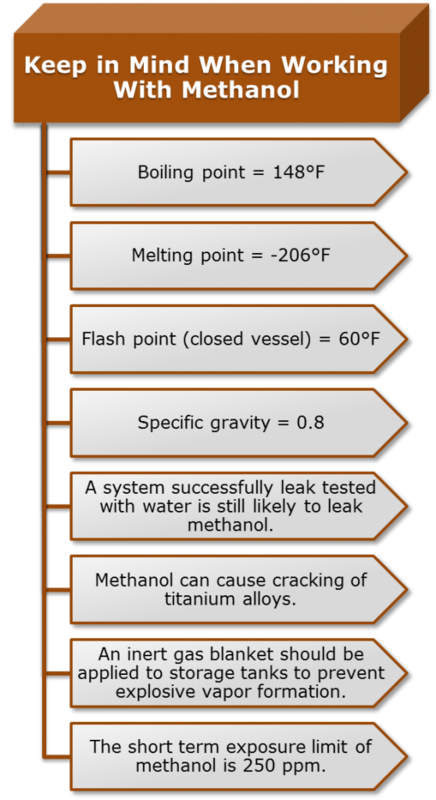 Following startup, methanol was continuously injected at the tree until the wellhead temperature was above the hydrate formation temperature. Methanol was injected subsea via a positive displacement triplex pump. Injection pressure was controlled by a recycle valve that routes flow back to the storage tank. This is a typical setup, however, this injection pump was designed with the capacity to treat all production wells simultaneously. Consequently, with no ability to control flow, the methanol system grossly over treated when injecting at a single well. As a result of excess methanol injection, after the initial startup of several production wells, the methanol concentration in the crude increased above sales levels. The operations team was forced to continuously water wash the crude in an attempt to lower methanol levels to acceptable limits for sale. The crude washing operation proved to be a very time-consuming and laborious process. In order to achieve a lower methanol injection flowrate, the project made the decision to load the Low Dosage Hydrate Inhibitor (LDHI) system with methanol and utilize it for delivery of methanol during production well startups and shutdowns. The LDHI injection system was a similar design to the methanol injection system; however, the injection capacity of the LDHI injection pump was less than half that of the methanol pump. Also, subsea metering valves at the LDHI injection points provided flow control that was lacking with the methanol system. The topsides portion of the LDHI system was successfully commissioned with water and then loaded with methanol. However, LDHI was not required for initial startup and operations did not expect to need it for the early life of the field. Therefore, the umbilical storage fluid left in the LDHI umbilical lines during commissioning needed to be displaced with methanol. The LDHI injection system consisted of a storage tank feeding a centrifugal booster pump with an automatic recycle valve at the discharge to the storage tank. Similar to the methanol injection pump, the fitted LDHI injection pump was a fixed volume, positive displacement triplex pump with a pressure control recycle valve. Unlike the methanol system, the recycle line at the discharge of the LDHI injection pump routed fluid back to the suction of the booster pump instead of to the storage tank. This was the major design flaw of the LDHI system. Before displacement of umbilical storage fluid with methanol, the LDHI system was isolated at the umbilical head in order to pressurize topsides pipework and perform a preliminary leak test using methanol. The LDHI booster pump and injection pump were started in full recycle and allowed to demonstrate stability before stepping closed the injection recycle valve to raise pressure in the topsides pipework. However, within minutes of operating in full recycle, the system shutdown due to low injection pump suction pressure. After several runs and a series of troubleshooting activities, it was discovered that the methanol recycling to the suction of the booster pump was heating up and vaporizing, causing cavitation in the booster pump. The umbilical storage fluid could not be displaced with methanol because it is not possible to operate the current LDHI system design with zero recycle from the injection pump. Therefore, piping modifications had to be made to reroute the injection pump recycle line to the top of the storage tank. In general, it is important that the chemical is recycled to the top of the storage tank and not at a spot near the tank outlet. Fluid entering the top of the storage tank is allowed the maximum amount of cooling time before entering back into the system.